This is an astonishing and beautiful illustrated early gothic chronicle scroll, originally intended to teach Europeans in the thirteenth century how biblical history was anchored in the Middle East. Before the twelfth century, few people in Western Europe had any realistic idea of where Old Testament history was set. This outlook was transformed both by the Crusades and by the radically new understanding of the Bible as a narrative work describing real people and historical events. Peter of Poitiers was the first and most famous exponent of this world view. This is an astonishing and beautiful illustrated early gothic chronicle scroll, originally intended to teach Europeans in the thirteenth century how biblical history was anchored in the Middle East. Before the twelfth century, few people in Western Europe had any realistic idea of where Old Testament history was set. This outlook was transformed both by the Crusades and by the radically new understanding of the Bible as a narrative work describing real people and historical events. Peter of Poitiers was the first and most famous exponent of this world view. His Compendium places Bible stories in a framework with the descents of the kings of Persia and Babylon, the rulers of Greece and the emperors of Rome. The format is astonishingly new: this is a roll, not like the scrolls of the ancient world to be read horizontally (such as the Jewish Torah), but vertically, in which the whole of history since Creation tumbles downwards like a waterfall. This became the model of all subsequent genealogies, even today. The Pirie Roll is the exact contemporary of the celebrated early gothic cathedrals, rich with imagery and artistry. It is a display item, always intended for public view. The pictures are of the highest quality, graphic and dramatic. It is no surprise that it was previously exhibited in the Metropolitan Museum of Art. The artist was English. Thirteenth-century art made in England is now almost unobtainable, and it if this had come from a British collection it would almost certainly have been unexportable: it has however been in America since 1959, and it has an international passport. Almost 3,500 mm. long (almost 11 ½ feet), the text of this scroll was designed to provide a summary of biblical history in the form of a genealogy from Adam down to the time of Christ. The vivid colors of the genealogy contrast with the six delicate pen-and-ink miniatures colored with wash. There are ten recorded English illustrated rolls older than 1300, of which the present example is the only one still known to be in private hands. The whole sweep of the history of the Ancient Near East is encapsulated in the names of successive rulers of the kingdoms of Judah, Israel, Syria, Assyria, Babylon, Greece (or Macedonia), Egypt, and Rome. 1. The script, minor decoration, and the style of the miniatures, executed in pen and highlighted in wash, support a date in the second quarter of the thirteenth century, probably c. 1230-1250; it was copied in southern England, and can be related to two secular chronicles, Cambridge, Trinity College, MS. O.9.34, and MS London, British Library, Lansdowne MS 782. Manuscripts in this graceful style are traditionally associated with St Albans Abbey, in the time of the great author and artist, Matthew Paris (fl. 1217-59), but this is unproven (Morgan, 1982, nos. 81 and 82), and there are no firm links to London; Oxford has also been suggested, which seems possible (Ross, 1969). 2. A few sixteenth-century annotations are evidence of this scroll's continued usefulness as a guide to biblical and other history; repaired on the dorso with patches from an English manuscript, also thirteenth century. 3. Sold London, Sotheby's, November 14, 1902, lot 276, to Sir Sydney Carlyle Cockerell (1867-1962), bibliophile, secretary to William Morris, and Director of the Fitzwilliam Museum, Cambridge (de Hamel, 1987, p. 208, no. 118). 4. Sold privately by Cockerell with eight other manuscripts in January 1957 to Bernard Quaritch. 5. Robert S. Pirie (1934-2015), of New York, purchased from Quaritch in 1959 (his bookplate with price code inside the fitted case). [Opens with the genealogy, t, "//Mainael, Matusael, Ada, Lamech, Sella …"; [first text], incipit, "Lamech primus <torn away> ducens bigamia<missing> virum …"; [main genealogy, running down the center of the scroll], "//Cainan, Malaleel, [expunged], Enoch, Matusale …"; [text], incipit, "Iubal pater canencium …"; [text, far right], incipit, "Post diluuium ex orta sunt iiii principalia …" …[final text], incipit, "Sub hoc archelao rediit ioseph de egypto …"; [final genealogy, Herod's sons], incipit, "Archelaus, Aristobolus, Alexander, Antipater, Philippus tetrarcha, Herodes antipas"; [final genealogy on the right, Anne's husbands, and her sister Hismeria's daughter and husband], incipit, "Salome, Ioachim, Cleophas, Elizabeth, Zachariah." Peter of Poitiers, Compendium historiae in genealogia Christi; there is no modern critical edition of this text; text printed from single manuscripts: Moleiro, 1999-2000, facsimile, vol. II, pp. 135-147, with Spanish and English translation pp. 93-129, reproducing Rome, Bibl. Casanatense, MS 4254 (Tuscany, thirteenth century); Vollmer, 1931; and Zwingli, Basel, 1592 (with interpolations, published as part of a universal chronicle). This scroll begins and ends abruptly y, but since the text of Peter's Compendium was fluid, particularly at each end, it is now impossible to determine exactly whether much is missing - possibly only part of the first and last membranes. We do not know what the original dimensions of these two membranes were. The first membrane now measures 544 mm. in length, and the last, 488 mm., but the extant complete membranes vary in length from 700 mm. to only 448 mm. The first name in the central genealogy is now Cainan (or Kenan), and the first text discusses Lamech, a descendant of Cain. If other texts or illustrations were once included before the prologue, then the scroll might have opened with an additional membrane (as for example, Harvard, Houghton Library, MS Typ 216). The scroll ends with St. Anne (mother of the Virgin Mary), her sister, Hismeria, and Anne's three husbands, Hismeria's daughter Elizabeth, and Elizabeth's husband, Zachariah. Again, the material included at the end of various copies varies, but it seems most likely that about half a skin is missing at the end. The text was of fundamental importance for placing biblical narrative in a historical context. It survives in numerous manuscripts (partial list of about 50 manuscripts in Moore, 1936, pp. 101-106; a more exhaustive list of about 80 in Stegmüller, 1954, pp. 362-364, no. 6778, also incomplete; see Hilpert, 1985, suggesting there must be at least142 manuscripts; see also Online resources). Although the text was almost certainly designed to be copied as a scroll, this form is far rarer than in the format of a codex. A more in-depth survey of the extant manuscripts and the textual versions they contain is necessary, but the present roll may be one of the earliest roll-format manuscript containing Peter of Poitiers's Compendium in its interpolated version. The first modern study of the text (Moore, 1936), observed that Peter's text circulated in three main versions. Subsequent studies (Panayotova, 2001, Monroe, 1990, and study by M. C. Vivancos, in Moleiro, facsimile, 1999-2000, vol. 2, pp. 18-19), have emphasized how complex and fluid the textual tradition is in reality, varying in layout, illustration, and exact textual content. Certainly the text grew with the addition of material from Peter Comestor's Historia scholastica and other sources; these interpolations are found in very early copies of the text. The text in this scroll belongs to the version scholars call the interpolated version. It includes, for example, the passages concerning the Virgin, "Beata virgo maria mater domini xii annorum fuit …," St. Anne, "Primum anna …," and Christ, "Conceptus est dominus noster …," printed in Panayotova as examples of passages found in the interpolated version (Panayotova, 2001, pp. 338-339). Peter of Poitiers studied at the University of Paris, where he attended the classes of Peter Lombard. He succeeded Petrus Comestor as chair of scholastic theology in 1169, and served as chancellor of the University of Paris from 1193 to 1205. The Compendium historiae in genealogia Christi is his most famous work. It is a schematic depiction of biblical history in the form of a genealogy of Christ. The text is arranged with a main central line of descent running from top to bottom, from Adam to Christ (continuing to the apostles in some copies), spanning St. Augustine's traditional six ages of the world. In this scroll the start of each Age is represented by a biblical figure: Adam for the beginning of human history (not present here), Noah for the post-Flood period, and so on, ending with Christ. On both sides of this central genealogical line are other biblical figures, including contemporaneous lineages of the ancient rulers of the Near East, Greece and Rome. Some figures are listed only by name, but short explanatory paragraphs are included to explain the significance of major figures and events in biblical history. The text, designed to help students master the often confusing events of Old Testament history, is an overview of the history of the ancient world, listing the Kings of Judah and Israel, and the successive great Empires that determined their fate, the Kings of Syria, Assyria, Babylon beginning with Merodach-Baladan, the Greek or Macedonian Empire beginning with Alexander the Great, the rulers of Egypt, and finally of Rome, including Julius Caesar. There seems little doubt that the text was designed to be copied in the form of a scroll where the long succession of genealogies could unravel in coherent lines from the top to the bottom. A thirteenth-century chronicle recorded Peter's death, and that "being mindful of poor clerics," he "invented historical trees of the Old Testament which were painted on skins." A prologue found in some copies reveals the author's intention: "Taking into account the great detail of biblical history and the difficulties students encounter when studying the Bible - particularly those who have no knowledge of the foundations of history - and also considering those who have no access to books and yet wish to hold the sacred narrations in their memory as in a sack, I have attempted to summarize the series of patriarchs from whom Christ is descended through the tribe of Levi and Judah in a single, small book" (Moleiro, Facsimile, 1999-2000, p. 93). The Prologue thus suggests that the work has two complementary goals, one pedagogical and the other mnemonic. The large number of surviving manuscripts, dating from the late twelfth to the sixteenth century, is ample proof of how successfully Peter's text functioned in these contexts and others. This very important work influenced later medieval genealogical representations, and occupies a central place in the development of universal chronicles and medieval historiography in general (Klapisch-Zuber, 2000; Gauthier, 2008). It was a source of inspiration to all succeeding representations of historical facts and genealogical trees, including universal chronicles and important exegetical works such as those of Nicholas of Lyra who makes use of its genealogical diagrams. Its influence is still perceptible in works such as the Fasciculus temporum of Werner Rolewinck, c. 1473. 5. (sheet 5) An aerial view diagram of Jerusalem and its six gates (circular diagram, with labelled, Habitatio regis et sacerdotum, at the center, and with six gates shown and named on the outer perimeter). 5. (sheet 6) The Madonna and Child enthroned, the Virgin offering her breast. The present manuscript also includes (sheet 4) a miniature in two registers representing, respectively: three standing kings, two holding a sceptre, one a sword; and two standing priests, dressed as thirteenth-century archbishops: each with mitre, pallium, gloves, and crozier. This iconography is unique to the present manuscript, and its exact meaning and relationship to the text is uncertain. However, it may be significant that it appears just above the diagram of the gates of Jerusalem, labelled "Habitatio regis et sacerdotum" (the residence of the king and priest) at the center. Sydney Cockerell was very likely the source of the observation reported in Bond and Faye (1962, see References) that the style of drawing is very similar to that of a copy of Thomas of Kent, Roman de toute chevalerie (Cambridge, Trinity College, MS. O.9.34). Morgan agreed with this stylistic comparison, and further offered for comparison the Chanson d'Aspremont, London, British Library, Lansdowne MS 782 (Morgan, 1982, nos. 81 and 82), but rejected the traditional tendency to attribute these (and other mid-thirteenth-century English colored drawings) to the "School of St Albans" and the circle of Matthew Paris. He dates both manuscripts to c.1240-50, but leaves the question of their place of origin an open question. Monroe proposed an even closer comparison with the slightly later Trinity Apocalypse (Monroe, Cambridge, Trinity College, MS R.16.2, Monroe, 1990; on this manuscript generally, Morgan, no. 110). D. J. A. Ross suggested that BL, MS Lansdowne 782 and Trinity College, MS O.9.34 were the products of a secular workshop, possibly located in Oxford. Exhibited at the Grolier Club, New York, in 1963, and at the Metropolitan Museum in 2009, fully reproduced in the catalogue (see References below). Bond, W. H. and C. U. Faye. Supplement to the Census of Medieval and Renaissance Manuscripts in the United States and Canada, New York, 1962, p. 406, no. 11. Books and Manuscripts from the Collection of Mr. & Mrs. Robert S. Pirie, exhibition catalogue, The Grolier Club, New York, 1963, no. 45 and frontispiece. de Hamel, C. "Medieval and Renaissance Manuscripts from the Library of Sir Sydney Cockerell (1867-1962)," British Library Journal, 1987, no. 118. 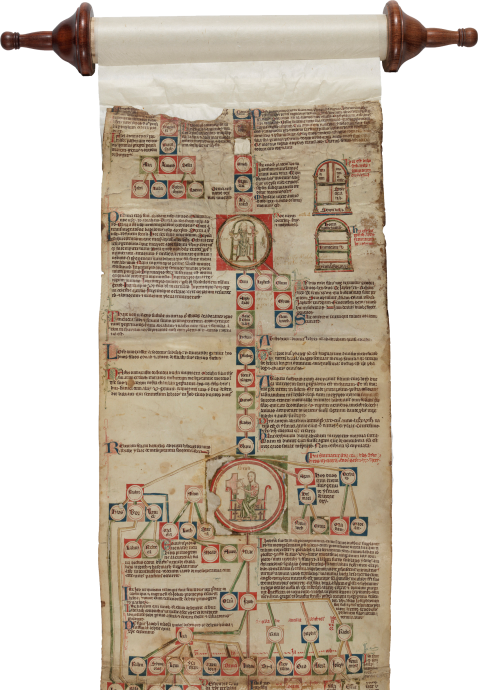 Monroe, W. H. 13th and Early 14th Century Illustrated Genealogical Manuscripts in Roll and Codex: Peter of Poitiers' Compendium, Universal Histories and Chronicles of the Kings of England, Ph.D. thesis, Courtauld Institute of Art, 1990, pp.172, 508-509. Panayotova, S. "Peter of Poitiers's Compendium in Genealogia Christi: The Early English Copies," in Richard Gameson and Henrietta Leyser, eds. Belief and Culture in the Middle Ages: Studies Presented to Henry Mayr-Harting, Oxford, 2001, note 8. Holdombe, M., ed. Pen and Parchment: Drawing in the Middle Ages, Exhibition Catalogue, The Metropolitan Museum, New York, 2009, pp. 113-117, no. 31. Alidori, Laura. "Il Plut. 20.56 della Laurenziana: Appunti sull'iconografia dei manoscritti della 'Genealogia' di Petrus Pictaviensis," Cicli e immagini bibliche nella miniatura: Atti del VI Congresso di Storia della Miniatura Urbino, 3-6 ottobre 2002, ed. Laura Alidori = Rivista di storia della miniatura 6-7 (2001-2002). Mary Carruthers, Mary. "'Ista est Jerusalem': Intertextuality and Visual Exegesis in Peter of Poitiers' Compendium historiae in genealogia Christi and Werner Rolevinck's Fasciculus temporum," in Imagining Jerusalem in the Medieval West, ed. Lucy Donkin and Hanna Vorholt, Oxford and New York, 2012. Gauthier, Marc-Edouard. Mille ans d'histoire de l'arbre généalogique en France, Rennes,2008. Hilpert, Hans-Eberhard. "Geistliche Bildung und Laienbildung: Zur Überlieferung der Schulschrift Compendium historaie in genealogia Christi (Compendium veteris testamenti) des Petrus von Poitiers (+ 1205) in England," Journal of Medieval History 11 (1985), pp. 315-331. Klapisch-Zuber, C. L'ombre de la parenté. Essai sur l'imaginaire médiéval de la parenté, Paris, 2000. Monroe, W. H. "A Roll-Manuscript of Peter of Poitier's Compendium," Bulletin of the Cleveland Museum, 65 (1978), 92-107. Moore, P. S. The Works of Peter of Poitiers: Master in Theology and Chancellor of Paris (1193-1205), Publications in Medieval Studies, University of Notre Dame, 1, Notre Dame, Indiana, 1936. [Peter of Poitiers]. Genealogía de Cristo; Genealogia Christi, 2 vols., Barcelona, M. Moleiro, 1999-2000 [facsimile Rome, Biblioteca Casanatense, MS 4254]. Ross, D. J. A. "A Thirteenth-Century Anglo-Norman Workshop Illustrating Secular Manuscripts," in Mélanges offerts à Rita Lejeune, Gembloux, 1969, pp. 689-694. Smalley, Beryl. The Study of the Bible in the Middle Ages, Oxford, 1984. Stegmüller, F. Repertorium biblicum medii aevi..., Tomus IV: Commentaria. Auctores N-Q, Madrid, 1954, no. 6778. Vollmer, H., ed. Deutsche Bibelauszüge des Mittelalters zum Stammbaum Christi, Potsdam, 1931. Zwingli, U. Petri Pictaviensis Galli genealogia et chronologia sanctorum patrum, Basel, 1592 [edition of the Compendium with interpolations incorporated into a universal chronicle].